Beaufort Sea polar bears are spending more time ashore. And it may be a wise move. 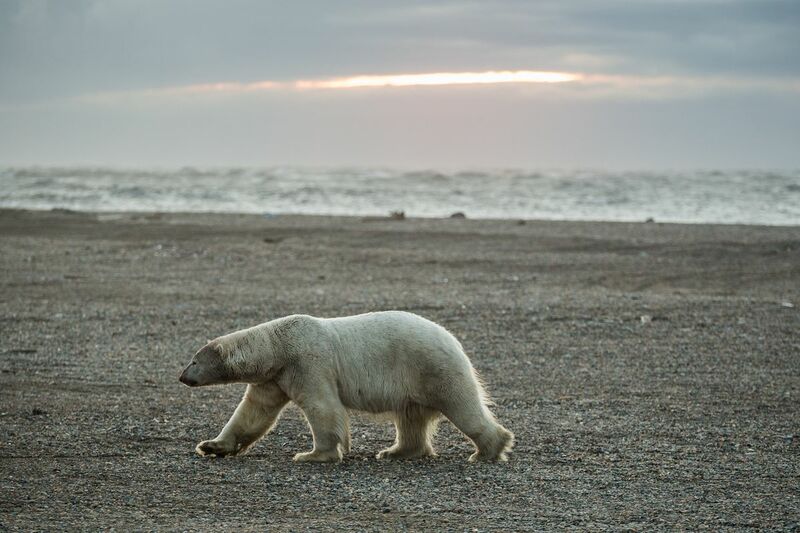 A polar bear walks along the beach in Kaktovik, Alaska, at sunset on Sept. 7, 2012. "That's where we found a turning point in the data series. Prior to 2000, there really was no trend," said Todd Atwood, a USGS wildlife biologist and the study's lead author. The study uses data from movements of 228 adult female polar bears that, over the period from 1986 to 2014, were fitted with 389 radio collars. Only adult females can wear the tracking collars; males' necks are too wide to allow collars to stay in place. The bears that come ashore still make up only a minority of the population, but they may be making the better choice, Atwood said. They seem to be making a beeline for piles of meat- and blubber-laden bones left after local Inupiat hunters butcher bowhead whales on the beaches, according to scientists' data. The bowhead "bone piles" near the village of Kaktovik are now autumn gathering spots for polar bears and even some North Slope grizzlies. The piles give the bears a source of high-fat food that the bears on the ice — which now retreats well north of the prime foraging grounds over the continental shelf — are lacking, Atwood said. "The way things are now with the bone pile, it's probably a good idea to come ashore," he said. "That's the next question. That's the next aspect of the work," he said. Also unknown is the long-term effects of the bears' reliance on the bowhead bone piles. "You can get in trouble once that bone pile is depleted," he said. The bears might smell whale meat in villagers' houses and follow their noses there, he said. "It's just natural for them to go where they smell that food," he said. "There's risk anytime you've got large numbers of large carnivores anywhere in close proximity to people," Atwood said. The southern Beaufort Sea population, one of 19 polar bear population groups around the Arctic, is one of the best-studied, Atwood said. Satellite-based tracking of the animals goes back to the 1980s, and there was presatellite radio tracking even before then, he said. The only other long polar-bear research record is in Canada's Hudson Bay, he said.